1 - 3 $24.95 ea. 4 - 6 $23.95 ea. 7 - 12 $23.45 ea. The National Eye Institute's AREDS2 Formula, now with 40 mg Zinc, shown to be as effective as 80 mg Zinc for more gentle digestion. 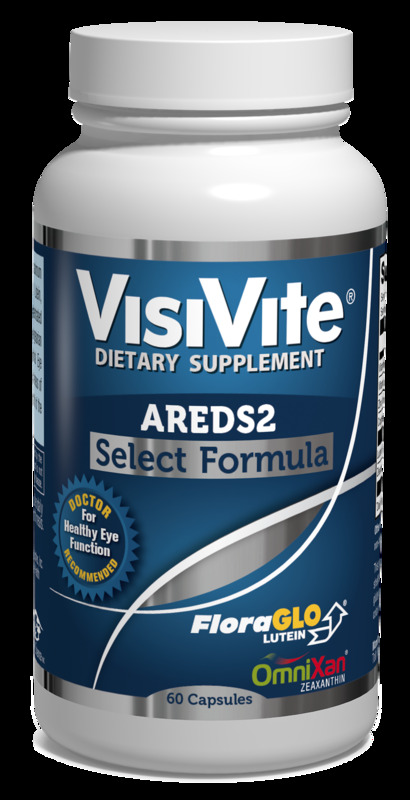 VisiVite AREDS Select Formula contains 10 mg Natural FloraGLO Lutein, 2 mg Natural OmniXan zeaxanthin from paprika, 40 mg zinc, 500 mg Vitamin C, 400 IU of Vitamin E, and 1 mg copper. Now with vegetarian capsules. Formulated by a university eye surgeon, VisiVite has been a worldwide leader in the manufacture of quality eye supplements since 2001.